Styled with andy sweater . With a waist-defining fit and a gentle curve at the leg, the menswear-inspired Malcom pant has a distinctly feminine feel. They're made with softly structured Italian stretch wool. The quality of the pants was good. 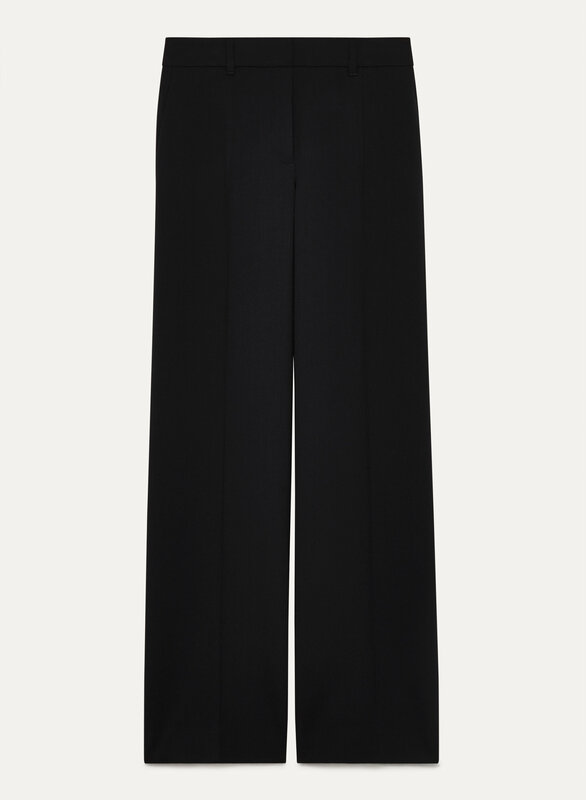 However, with the wide leg I think they might be more suited for girls with longer legs. I’m 5’4 and they were quite boxy. I got a 00 which is typically my normal size. Love this pant. Very comfortable and nice material. I sized up as I have muscular thighs. I am normally an 8 and sometimes a 6. The pockets pull a little because of this. I purchased in tall and they are perfect with a small heal. The look, the fit and the feel of the pants is good. Only thing is the stitching is not the best because I keep pulling out threads that are hanging out and one spot looks like it has a tiny hole along the stitching.